Jennay hails from sunny California but has made her home in Denver since CVV as she is studying for her Master’s degree in Theology. During the summertime when I was growing up, my mom would take all our clean laundry into the backyard in a big wicker basket (that, when empty, also doubled for a great hiding place when playing hide-and-go-seek). She would hang the laundry up on the empty arms of a long clothesline that stood in our large backyard. 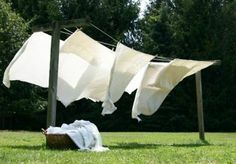 I remember watching her using clothespins to bind all our clothes and sheets and towels to this clothesline, seeing them blow in the breeze, feeling the stiff nature of cloth after it had been air dried, and worrying that afternoon Minnesota thunderstorms would dampen the drying effort. When I think about faith, I desire to have, but so often fall short in pursuing, an integrative faith in which every aspect of my life hangs on prayer and communion with God, like a clothesline. I often run into a tendency to compartmentalize in my life now as a full-time grad student. I suspect I’m not alone in this struggle. It is so much easier for me to switch into school mode, scribble notes from a lecture, read umpteen amounts of pages, and write a paper, without inviting Jesus into this process of study and work. And what is really ironic is that I’m studying theology. Just like an article of clean, wet clothing cannot dry (well, maybe in Colorado’s dry climate, but let’s ignore that for the sake of the metaphor) without being attached to the clothesline, so every facet of my life is defunct if separated from prayer and communion with God. We must intentionally hang our actions and relationships and words and thoughts on prayer. Even if all our clothes are not securely fastened to the clothesline of prayer, even if they’re hanging on by a thread, I think God is pleased. I find encouragement in what Brennan Manning says: “The only way to fail in prayer is to not show up.” So let’s show up, and bind every facet of our life to the One who gave us life. Brennan Manning, Abba’s Child (Colorado Springs, CO: NavPress, 2002), 173.